A goal is scored, or a try is run in, or a wicket is taken – and the crowd goes wild. Now, for some weird reason, it’s become common among stadium management or club management that a cheering crowd is an abnormal din, a crack that needs smoothing over. Some bright light in the stadium’s bowels presses a few buttons and something like Katy Perry’s Firework comes on. Now this element of the gameday attendance – which is probably termed in management loser speak as ‘fan experience’ or something super lame – raises a load of questions. Who asked for music to played? Was there a gap in fans’ happiness discovered by numerous marketing surveys? Does the atmosphere really suffer if a song isn’t played, or on the contrary, is it enhanced by the song’s playing? Why chart-topping songs? Is it a marketing attempt to appeal to the demographic of charting music (let’s not kid ourselves, it’s young people, mainly women) that doesn’t really overlap with the demographic that regularly attends sporting events? On that note, is it an attempt to turn casual sport attendees into regular attendees by playing a ten seconds of one of their temporary favourite songs? To be fair, music does have a place in sport, as team songs, fan songs and the standard pre-match entertainment or build-up. Outside of that, the music used in live sport is just so horribly implemented it rises to insulting and patronising, especially if the intention behind post-score music is to stay the masses from becoming bored, god forbid, from witnessing what they’ve come to see. 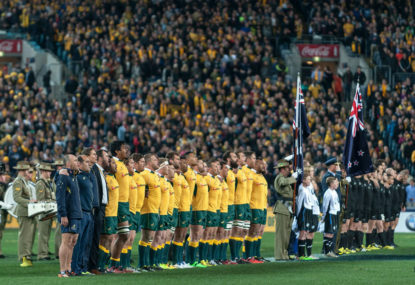 On last Saturday night at the Bledisloe in Homebush, music and live sport intersected in a way that I don’t think I’ve ever witnessed before. Music was superbly used, and with a clear intent. Quite apart from most of what the ARU do, whoever they’ve hired or whatever plan they’ve put in place in relation to stimulating matchday atmosphere actually worked and was effective. Prominently, there was The Gold Brigade beneath one end’s goal posts, a block or two of pure canary gold chanting, waving and generally creating a ruckus that kindled the rest of the crowd into life. Even if most of the noise generated was the pretty rudimentary ‘Wal-la-bies’ chant. As Hugh said, between every slow down of the action – especially in the setup of a line-up – a slice of a pounding song was introduced to stress the tension, pulling the usually quiet crowd towards finally using their voices. The introduction of the ‘Stronger as One’ motif, typeset with negative space resembling the line of a healthy heart beat, also seemed to actually be a well-integrated part of a carefully thought-out strategy rather than just another tossed out marketing gimmick. Israel Folau has had a heartbeat line shaved into his head; one wonders if that was part of the plan as well. Australian sports crowds, especially when compared to English ones, are quite voiceless and uninventive in their atmospheres. It’s easy to say that without any hard evidence that the super-fairweather Sydney crowds are comfortably the least vibrant in a grey nation for sporting atmosphere; the prawn sandwich-eating patronage of rugby being the worst of the four footballs. Sure, there were a lot of factors riding on Saturday’s game that made it naturally quite tense. Still, all credit has to go to the ARU for not only putting on a great atmosphere. They have had the pre-game Army marching band cheekily play Waltzing Matilda as they left the field, but rather predictably the crowd didn’t pick it up or weren’t bothered to. It was an atmosphere in Sydney sports that in recent memory only second to possibly the Sydney A-League derby.